Here I’ll talk about 4 online poetry publishing websites that are available for free. The site requires you to sign up. After that, you can mention the required information. You can enter the title of the poem, select genre, drop the poem in the box. Thereafter, you can hit the Submit button. One of the sites is specifically for kids where they can publish their poem. Once you submit your poem, it does not publish instantly. You will be notified via email once your poem gets published. It is very easy to create poems online with the help of online poem generators. But when it comes to publishing poems online you might have to pay for that. So, here I’m covering those sites that let you publish poems online without any cost. Although these sites have some limitations. But it can be a good option to get exposure as a beginner poet. Let’s go through each website and publish poetry online. Family Friend Poems is an online poetry publishing platform. The site publishes the best poems. You can follow their conditions to make readers read your poem. If you want to publish a poem online then you can visit the Submit poem Form. There you can fill required information such as your first, middle, and last name. Your first name and email id are mandatory. The next step is to introduce your poem. Firstly, you have to mention the heading of your poem. And then, write a short introduction of 500 characters maximum. So that it can define what the poem is all about. After that, you can enter the title of your poem. Also, you can mention the category or sub-category of the poem. The last step is to write a poem. You can drop your poem in the box below. You can write 3000 characters maximum. And then hit the Submit button. The site provides your formatting guidelines so that you don’t make any mistake before publishing. You have to agree to their terms and conditions as well. Also, the site does not publish your poetry instantly. It is a process. Once you submit your poem, it will notify you via email. Scholastic is another online poetry publishing free website. This is a website where you can read, write and publish poems. This is a great option for kids as they mark their grades before publishing the poem online. In order to publish a poem, you can enter the title of the poem in the first box. 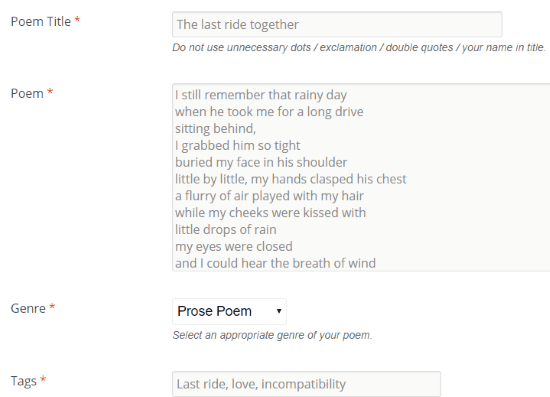 Then, you can enter the poem which you want to publish. After that, you can fill the required details such as your first name, initial of your last name. Besides that, you can choose your grade from K to 12. As I said, it is the best website to showcase your writing skills. 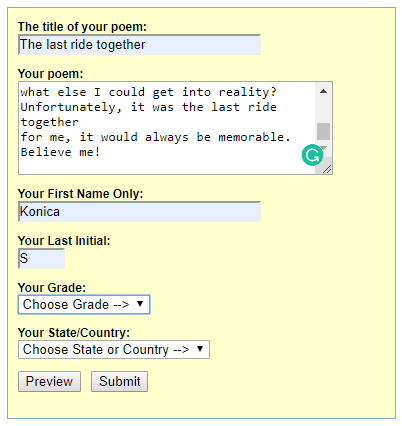 Kids can submit their poetry and it appears on the site with their name and grades after a few days. High On Poems is an online poetry publishing website. You can easily publish poetry. For that, you have to follow a few conditions. You can mention the title of the poem. Make sure you don’t use unnecessary exclamation, dots, repeated quotes, etc. Then, you can enter the poem in the box below. The site lets you add genre as well. You can take help of the dropdown, it has genre like Balled, Elegy, Ode, Sonnet, etc. 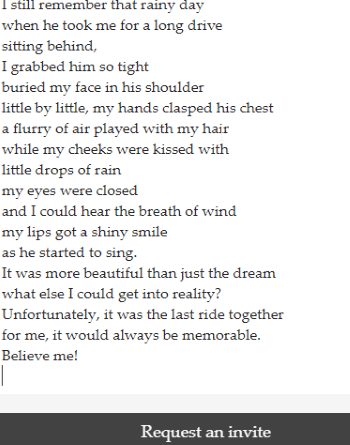 Also, you can upload the image for your poem. The site lets you upload a picture from your computer or choose a licensed image directly. It is necessary to add three taglines within 110 characters. 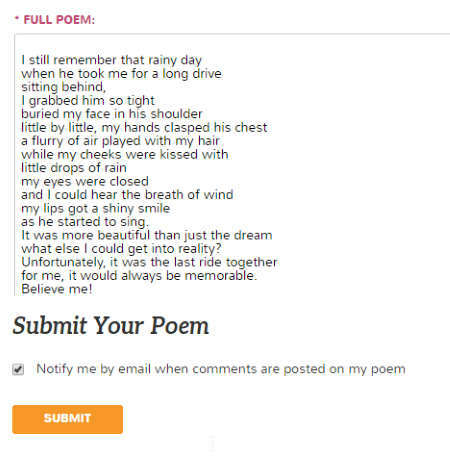 Thereafter, you can click on the Submit Poem button to publish your poem. Hello Poetry is a website where you can create to publish your poem. The method of posting your poem is a bit different than the other sites. You can enter your email id and password. Also, you have to enter your poetry while signing up. It is a process to request for joining the platform. And once you post your poem, it notifies you. Though there are other publishing houses where you can publish your poem. But publishing poem online is easier. Especially when you get this opportunity for free. The above-mentioned sites may help you to reach new poets. You can get exposure by publishing poems online. And then, you can start working professionally if you feel like doing it right.